Come on board the Western Kingfisher, Johnny King’s fast an modern Lochin 40 operating from Cleggan Fishing Village in Connemara. Powered by a 420HP Caterpillar engine, she cruises comfortably at 20 Knots and has a cruising range of 30 miles. The Western Kingfisher carries a Dept. of the Marine license for 12 anglers, though for comfort and space, groups of eight to ten are preferred. Angling gear is available for hire on board, including specialist Blue Shark and Blue-Fin Tuna tackle and rigs for reef and bottom fishing. 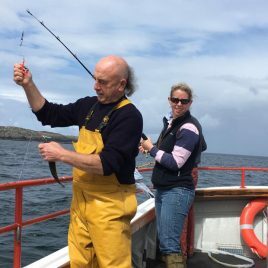 The Western Kingfisher is owned by Johnny King and skippered by Ramie who has over 30 years experience fishing the rich waters off the Connemara Coast. The fishing grounds lie between Slyne Head to the south and Achill Head to the north, providing a wonderful variety and choice of marks, depending on conditions.